When you are creating basic user interfaces elements using XAML, you might elect to use the XAML designer. This allows you to drag and drop controls from the toolbox into designs for windows and controls, such as those used when creating WPF applications. You can create user interfaces using just the designer and the Properties window, or you may fine tune them by editing the XAML directly. Some developers prefer to create WPF elements by only editing the XAML. For these users, the XAML designer can be a distraction, particularly if it is slow to use. Sometimes the designer is unstable, causing Visual Studio to crash completely or to hang for long periods. In these situations, it can be beneficial to disable the XAML designer for newly opened items. You can disable the XAML designer using the Options dialog box. To do so, open the dialog by selecting the Options item from the Tools menu. Once visible, expand the "Text Editor" section, then the "XAML" section at the left of the dialog box. Select "Miscellaneous" to show the correct options. 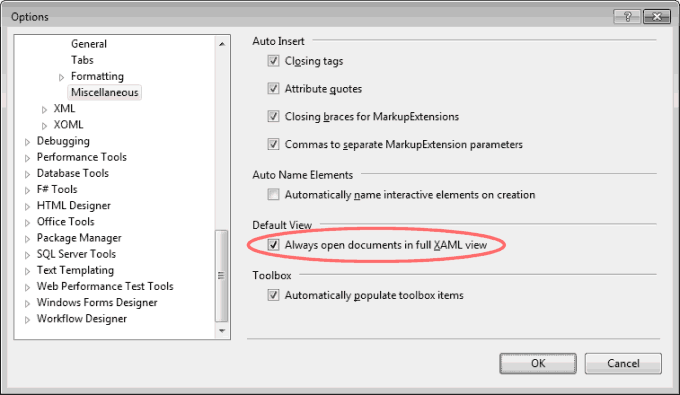 You will find an option named, "Always open documents in full XAML view". Tick the checkbox to disable the designer. Once disabled, newly-opened XAML files will show the XAML code in the available area. The designer is disabled for newly opened items. If you still wish to see it, perhaps to check that the user interface appears as expected, click the Design tab at the bottom of the screen or right-click the XAML code and select, "Show Designer" from the context-sensitive menu. You can also drag the horizontal bar next to the Design tab to split the screen and view the design and the XAML at the same time.